So What’s the Cost of Solar? Finance or Lease your Solar Energy System for the Best Solar Panel Cost? There’s a lot at stake in a solar estimate. While solar panel system costs fell by over five percent in 2015, according to data coming from the Lawrence Berkeley National Laboratory, the average price is still $20,000 or more. However, solar is an investment in your home’s energy future. The money you save on your electricity bills can more than earn back your initial installation cost after a few years. Meanwhile, there are plenty of incentives available from both the government and local energy providers, which can significantly speed up your return on investment and give you an accurate solar panel cost. To accurately predict how much you’ll spend overall, you need to know your home’s average utility spending, your rooftop’s solar potential, the average system cost for your area—and the ins and outs of your region’s incentives. That’s a lot of variables to consider! Fortunately, calculating solar costs is finally getting easier with our solar panel cost calculator and information. If you’re looking for an exact solar estimate today, just plug your address in the ModSun Solar Panel Cost Calculator. Over 70,000 homes in the US have been measured for their solar productivity using Light Detection and Ranging variables, so once you provide us with your location, we’re able to ping our database and calculate the right size system for your home—and just how much energy you can expect to generate in a year. We also factor in the average per-kilowatt utility spending in your area to help you understand your monthly electricity expenses at a glance, and the percentage of that spending you can anticipate that you’ll offset with a new solar energy system. Once you have those numbers in mind, keep scrolling to see your initial system price—whether you decide to buy, lease, or loan your system out using a Power Purchasing Agreement—and, most importantly, how much we predict you’ll get back from the government and local power companies through incentives and metering programs. Click on More Info to expand out your total incentive amount and learn about each program in your area. Here, you can also determine your long-term savings with each purchasing method, as well as what you’d need to put down today to make solar a reality. In fact, if you have specific savings goals you’d like to achieve with your solar energy purchase, you can receive an even more personalized estimate by answering the questions at the bottom of the screen before you enter your address. That way our team can help you find the best system to meet your financial needs and buying timeline. Then, when you’re ready, use the Save & Share button at the top of the screen to send your results to a significant other or friend, or click the Go Solar button to connect with a Geostellar Solar Specialist. Have you noticed an increase in the shiny black grids on everyone’s roofs over the past few years? Your eyes aren’t deceiving you—the number of homes with solar panels grew by a whopping 1000% from 2006 and 2013. The Department of Energy expects that trend to continue and estimates that one million homes will have solar panels by 2020. Why so much growth so fast? It was all thanks to a big drop in solar prices over the last few years. So if you’re looking at cashing in on this boom and are wondering what it will cost—and what you can save—here ‘s what you need to know. Solar costs dropped dramatically recently when the Chinese government influenced the worldwide solar market by pouring low-cost financing into the sector which boosted solar panel manufacturing more than ten-fold from 2008 to 2010. With so many more solar panels on the market, prices plummeted, falling from $2.79 per watt to $1.59 per watt. That was bad news for competing solar panel manufacturers, but great news for consumers who benefitted from low prices. With the fall in solar panel prices, soft solar panel costs now constitute the bulk of what you pay when you install solar on your home. Fortunately, as more people adopt solar power, soft costs have fallen as a result—a trend that’s very likely to continue. An analysis by the federal government’s National Renewable Energy Laboratory (NREL) discovered that installed prices have fallen at an average annual rate of 13% to 18% per year since 2009. And while declines in panel prices have flattened, soft costs continue to fall. NREL notes that from 2013 to 2014, non-panel costs have fallen 10% year over year. The first has to do with solar energy. Since solar panels convert sunlight into electricity, it makes a big difference how much sun your house gets—which is greatly affected by latitude, altitude, orientation, and cloud cover. This will impact your overall solar panel cost. Southern states get more sun than northern states. But southern states with higher altitudes and less cloud cover—think of Arizona and New Mexico—get more energy from the sun than states such as Florida or Georgia. So, for the same size house, you would need more solar panels in Georgia than you would in Arizona. Remember, the sun may be shining, but if it is behind a cloud, you’re not getting any solar energy. This means that a solar panel in San Diego will produce more energy in a year than the same panel in Seattle. 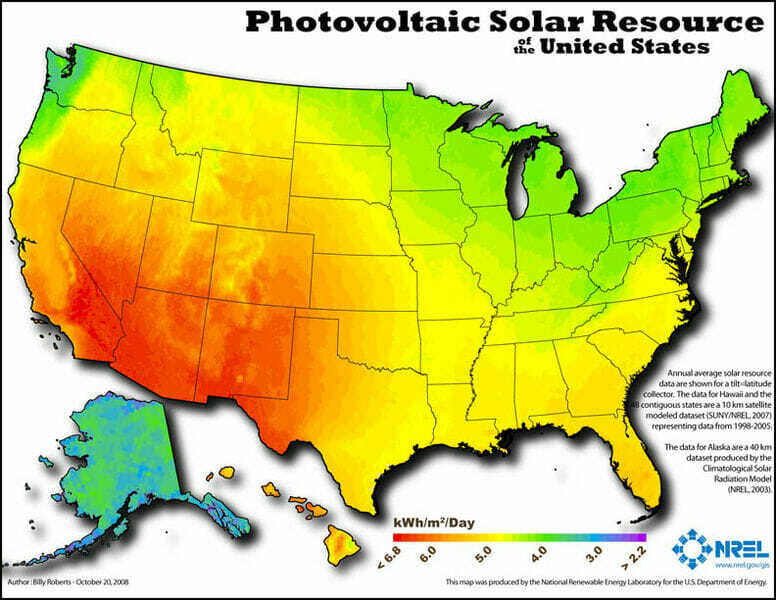 The image below will help you determine the solar energy, known as solar insolation, in your area. The next variable is your house—not just its location, but its size and orientation, too. A house with a southern orientation will get more solar energy. A bigger house will usually require more electricity, but will also have more roof space available for solar panels. To know how many solar panels you will need, you need to know how much electricity you use. The average house in the United States uses about 900 kilowatt hours (kWh) a month—roughly 11,000 kWh a year. You can easily calculate your actual usage by looking back at your electricity bills. As a general rule of thumb, a 3-kWh solar system will generate about 3,600 kWh to 4,800 kWh per year. A 5-kWh system produces about 6,000 to 8,000 kWh per year, and a 10-kWh system can produce about 12,000 kWh to 16,000 kWh per year. Depending on the size of the system, the solar panels cost would be between $4,000 and $16,000. Add in another $3,000 to $10,000 for other necessary components such as racks for the panels, wiring, and inverters, and the upper range solar panel cost is now close to $26,000. The cost to install those components varies according to region and includes not only labor costs, but also the cost of local permits and inspections. Generally, installation costs range from $2,000 to $5,000 per installation. Finally, there are operating costs, which include monitoring, maintenance, repairs, and insurance. Operating costs also vary by locality, but they also have the potential for cost savings if, for instance, monitoring is not needed or repairs are minimal. A ballpark range for operating costs is $4,000 to $8,000. Putting all the parts together yields a total cost in the range of $13,000 to $39,000. But the cost of a solar system is only part of the picture. Make sure to take into account any federal and state incentives available that can reduce the initial cost of a solar system. Knowing the solar panel cost of a solar installation is only the first step. Next is analyzing the solar panels cost as an investment. What is your likely return on investment (ROI)? You can calculate ROI a couple of ways. A common approach is by calculating payback. What did the installation cost? And how much will you save each month on your utility bill by using solar? Taken together, these two numbers show how quickly your savings will cover your initial costs. Those measures are interrelated and, once again, they depend on location. Electricity rates vary by region—they’re higher in the Northeast in the Northwest, for instance. Solar tends to be more cost effective where electricity prices are high. Another factor can also play a significant role in these calculations. In states where net metering is in effect, consumers can sell the excess solar energy they produce back to their local utility. That lowers their electricity bill, shortening their payback period and raising their cost savings. Luckily, with so many moving parts, it is helpful that there are several web resources to help consumers with these calculations. In addition to federal and state government sites, utilities, industry groups, and solar power companies also have useful online solar calculators. Up to this point we have been considering solar system arrangements that require an upfront payment from the homeowner. But that’s not the only way to go—there are several options that bundle installation costs into a consumer’s electric bill, either as a lease or as a power purchase agreement. In some cases, it can reduce the upfront cost for a homeowner to zero. Leases allow the homeowner to install solar panels without paying anything (or much) up front reducing the overall solar panel cost. After the panels are installed, the homeowner pays only a flat monthly fee. The fee includes the installation costs, which are spread out over time, and the cost of electricity supply. It is worth noting that under lease arrangements, the solar company usually keeps any incentives that are associated with owning the solar panels. But the consumer gains other advantages. For example, the solar company may offer a monthly fee below the utility rate, or one that doesn’t rise as utility rates do. At the end of the contract, homeowners can renew, purchase the system, or have the equipment removed. These type of third-party financing arrangements have a lot of benefits for consumers—the best being no large out-of-pocket investment. And the solar system becomes cash flow positive from day one. Not surprisingly, these agreements have been a big factor in driving today’s solar energy boom. Solar power may be simple in concept, but in application it can be bewildering. And the best approach for one homeowner isn’t necessarily the best for another. Take the time to gather the pertinent information —about house size, local solar insolation, existing electric rates, and consumption. It’s worth it in figuring out your potential solar cost for your home.